This dough forms with a literal splash of water. Avoid the temptation to add more. Hmm? You thought I was done with teff, Dear Reader? Not until he bag ends, I just did exactly what I said I would. I took away the oil, I rationed the water to the bare minimum and used our friend Flaxseed to help with the stability. These are a rework of another recipe, linked below in the photo caption, that had all the properties I needed to make a test of my theory. Not to be insufferable, but I was right. I put a lot of thought into what I say here so I’m often right by dint of hard work, research and smart silence. This works best with dry hands unlike the original. So, these don’t take all that much work to come together, when I started to stir in the apple and egg mixture I was tempted to add more water, but I knew that’d cause issues when working the dough, now perhaps you could get away with it, but I saw no real benefit, the greatest strength of teff is that it is inherently a moist feeling flour, it seems to need very little added moisture to feel moist, I was going to say mouth moist, but thankfully resisted, when baked. The slow bake helps here and they do bake fast, but make sure they are fully baked before removing them, they can be hard to gauge as they harden quickly. 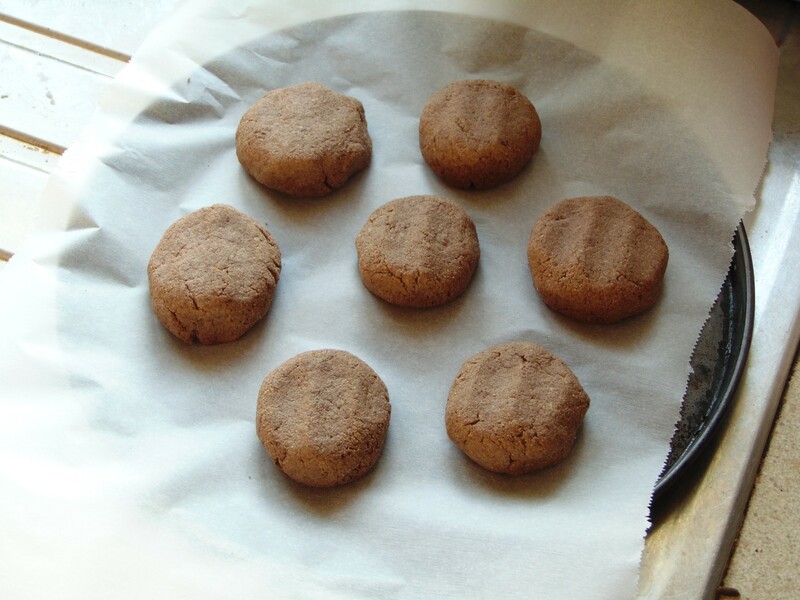 Low heat preserves the flavour of the flour. 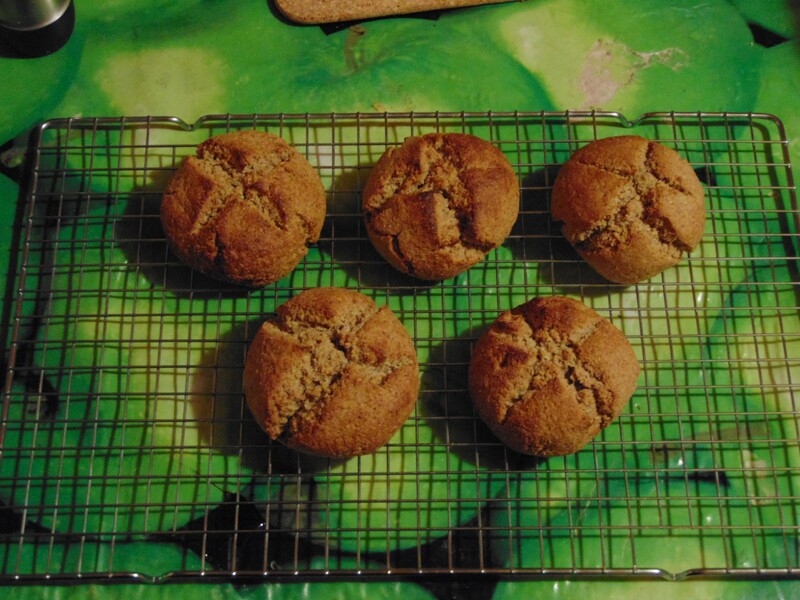 I left these to cool as they were harder than their buckwheat counterparts. They cut without much crumbling, they they seem brittle at first they held just fine as you can see. 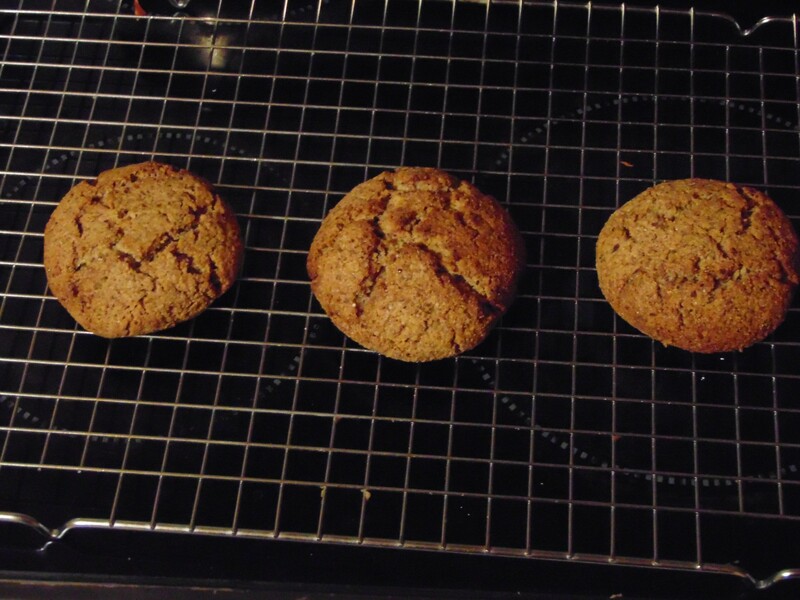 They have a very crispy, crunchy exterior and a slightly chew, springy interior, thank the apple for that, I really loved the contrast and the flavour of the teff survives and isn’t overpowered by the sugar as there isn’t much used here, it can be omitted completely too. You need something like butter or a non-dairy fatty spread to really highlight the teff’s sweet, indistinctly nutty flavour. Teff seems to be best suited to savoury pairing, it doesn’t really work by itself and it certainly isn’t that suitable for desserts. Not to say you couldn’t, but I’m not going to try further on that line. Lack of oil helps too. So, I’m getting near the end of the bag of teff flour. I’m not getting a second as I have a press full of buckwheat, some bags of brown rice flour and a little quinoa still. I never like to waste anything and the dates on these will run out if I keep playing around with other flours. I’m glad I took the chance while I had it, I always say that we should all take any opportunity to learn about different preparations and ingredients. Oh, I was poking around in my freezer and realised I have way too many pounds of raspberries and didn’t want jelly again so I instead juiced them, the compost gets the pulp, have no fear, Dear Reader, no waste here, added grated garlic, salt, butter and diced apple and cooked it all down into a thick sauce for dinner. Tart, pungent and just slightly sweet. I forgot to take a photo…twice actually. I have a lot to eat in my freezer from last year’s garden and I’m already starting to get some seeds in. That’s another post though, I’ll be back with a few more teff recipes as the bag finishes, until then take care, Dear Reader. 1. 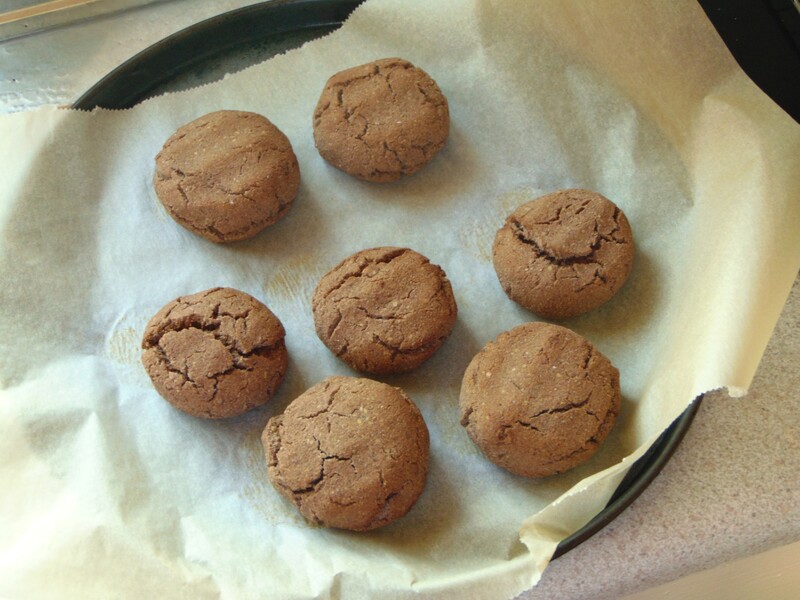 Add Brown Teff Flour, Sugar and Baking Powder to a bowl and set aside. 2. 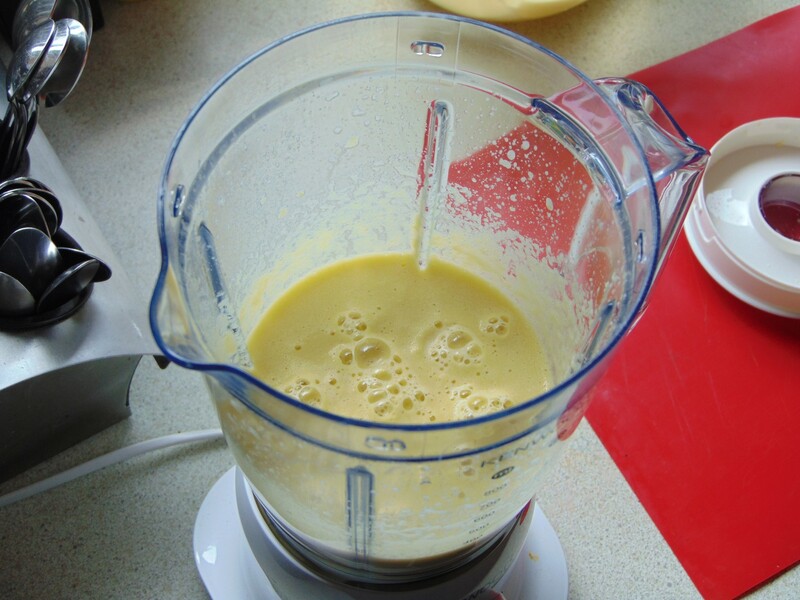 Blend Apple and Egg in a food processor or blender it becomes pale and foamy. 4. 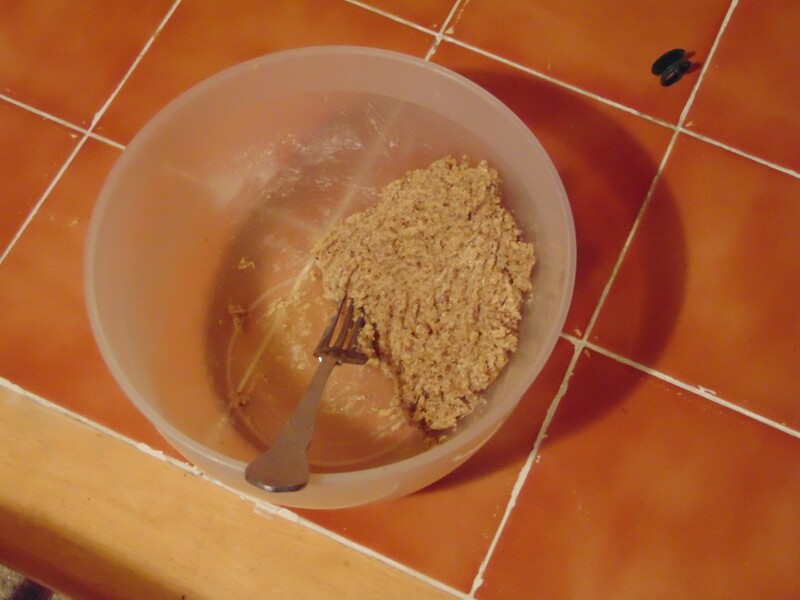 Add the Apple mixture to the dry ingredients and mix using a fork. 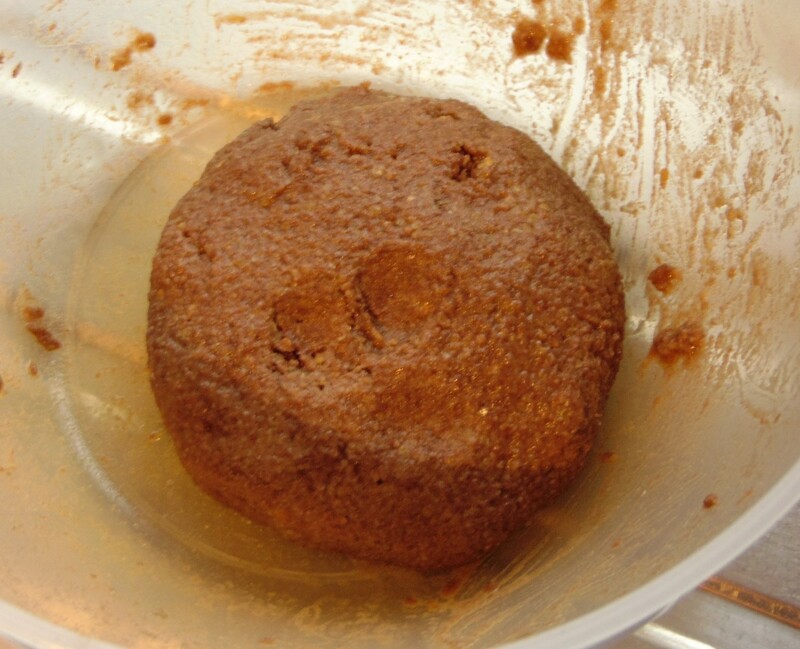 A soft, thick, slightly sticky Batter will form. 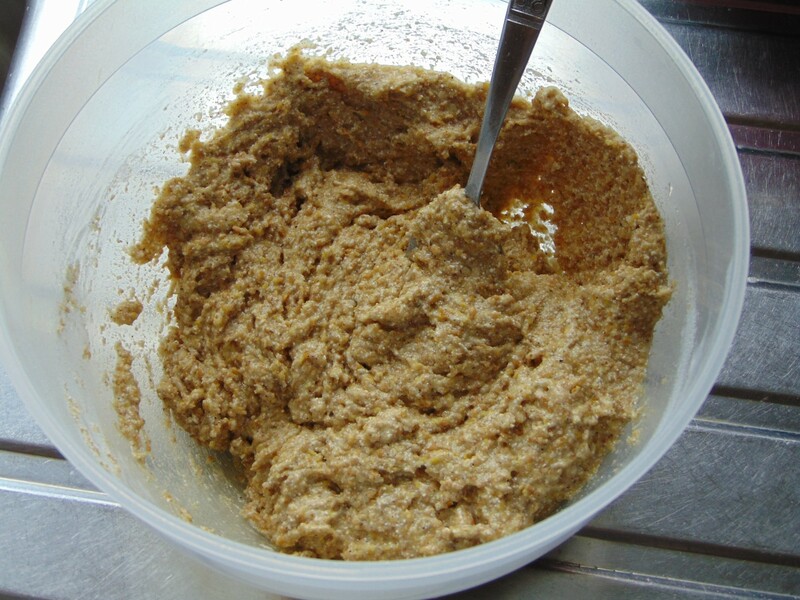 If needed add a little Water, but don’t add any more than necessary to make the dough form. Rest for 5 minutes. 5. 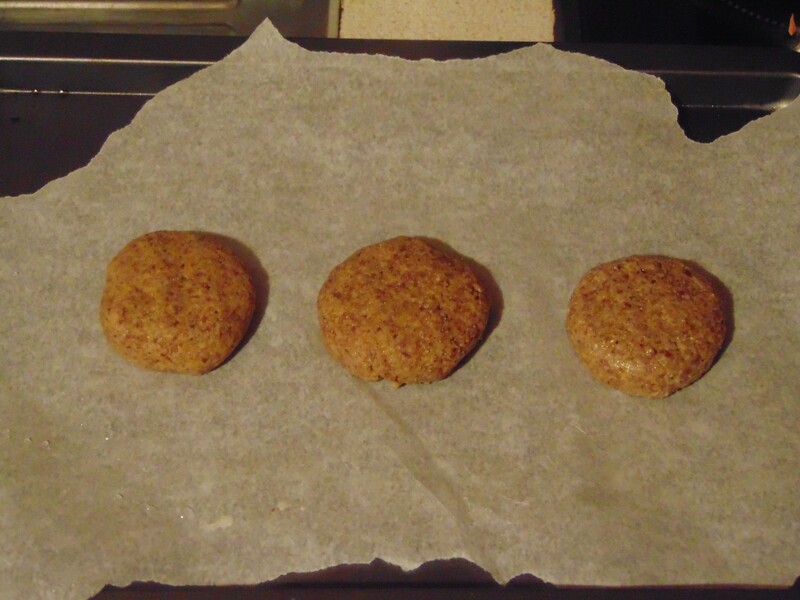 Pre-heat the oven to 200c (Fan) and line a baking tray with grease-proof paper. 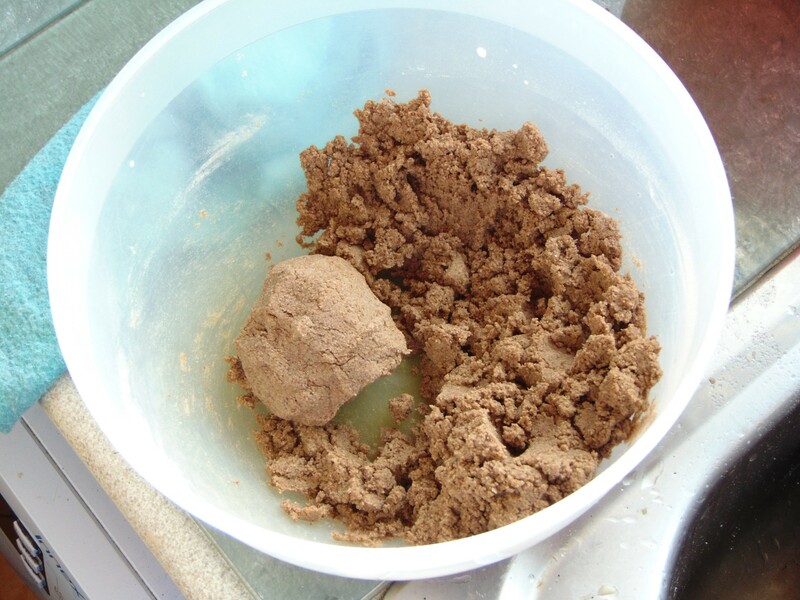 Scoop up a dessert spoon of the dough, it will be soft, slightly brittle and somewhat sticky, form into a ball, place onto the tray and press down gently. Repeat until dough is used up. Bake for 10-15 minutes or until Golden Brown, firm to the touch and hollow sounding when bottom is tapped. Transfer to a wire-rack and cool for 10 minutes. These are really quick to prepare. The dough, if you can call it that, has an extremely strange texture. 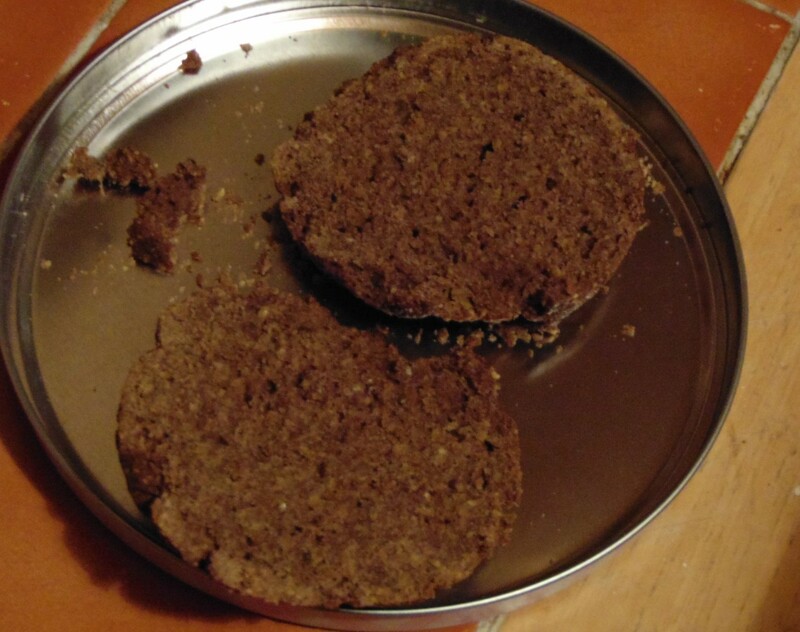 Now, Dear Reader, I’ve had one failure, I tried making tortillas like my buckwheat ones and found that though teff absorbs a little water and hold itself together somewhat it is extremely sticky, like amaranth or quinoa in that regard. 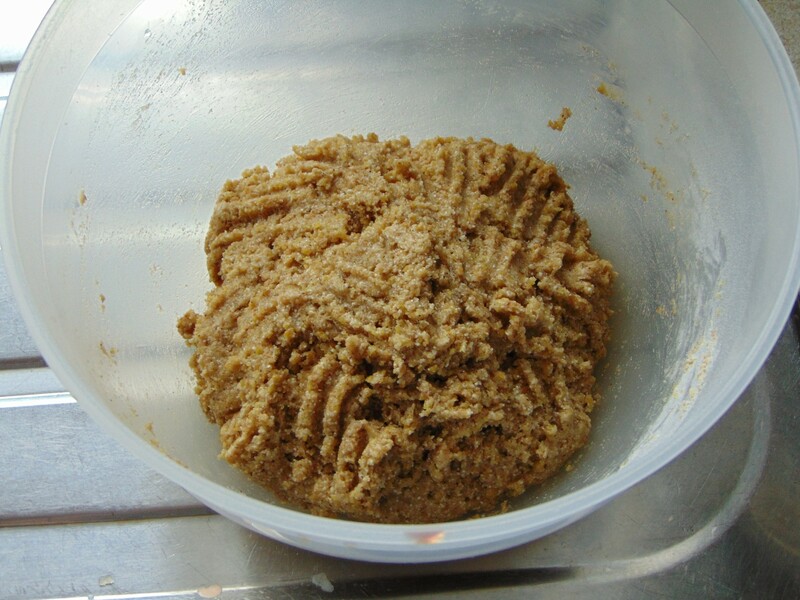 If it were used in pastry you’d need to mix it and honestly I have enough recipes using single flours so I feel no need to go to something like teff and try and make it work. Buckwheat remains king of the free from flours in my book, but teff is hanging in there so far with quinoa, the second best, and amaranth, an okay flour, but nutritionally varied. I have a lot of recipes, Dear Reader, I’ve made ones that I marvel at myself, that’s not arrogance just the truth that we’re only scraping the surface as to what can be done with these flours. If I were a professional, if I were making money on these recipes I might be more inclined towards pushing the envelope with teff flour, but I’ve been there with buckwheat, with quinoa, with rice flour, I’ve dabbled successfully with banana flour, amaranth, sorghum and maybe I’m forgetting a few. 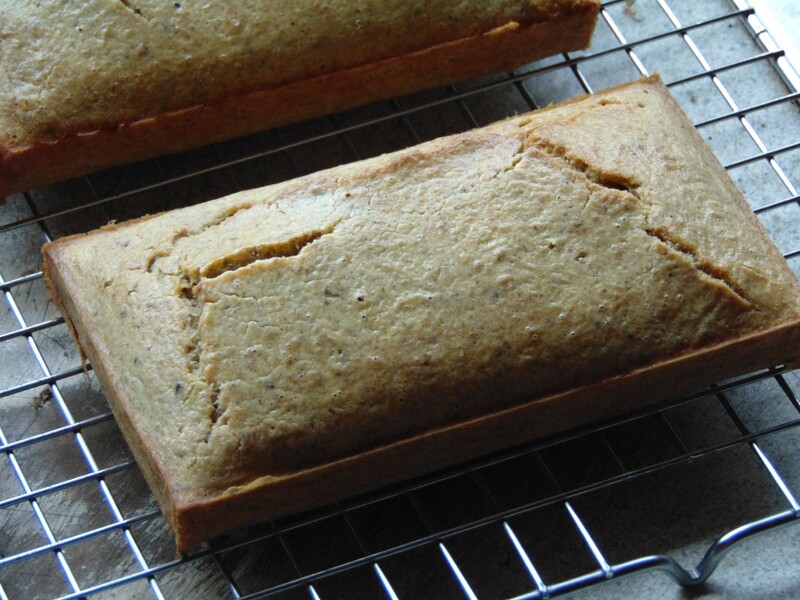 I’ve used flaxseed, ground pumpkin seeds and sunflower seeds as flours. I’ve done a lot, Dear Reader, with very little guidance, so when I say teff has uses I’m looking for the easiest to predict and the most useful. It’s not that I can’t, though I can’t work miracles, not without added gums or starches, but that I don’t need to. that isn’t to say you can’t try, Dear Reader. As for me, well, I’ll have a lot more teff recipes before I’m done, I didn’t say I was done yet after all. You can see where the dough hadn’t quite joined itself. Rough and ready baking at its finest. Imagine a water-balloon filled with wobbly jelly, feel it in your hands, jiggly it in your mind, Dear Reader, that’s what teff dough feels like here. It’s so alien I had no idea what it’d bake like. 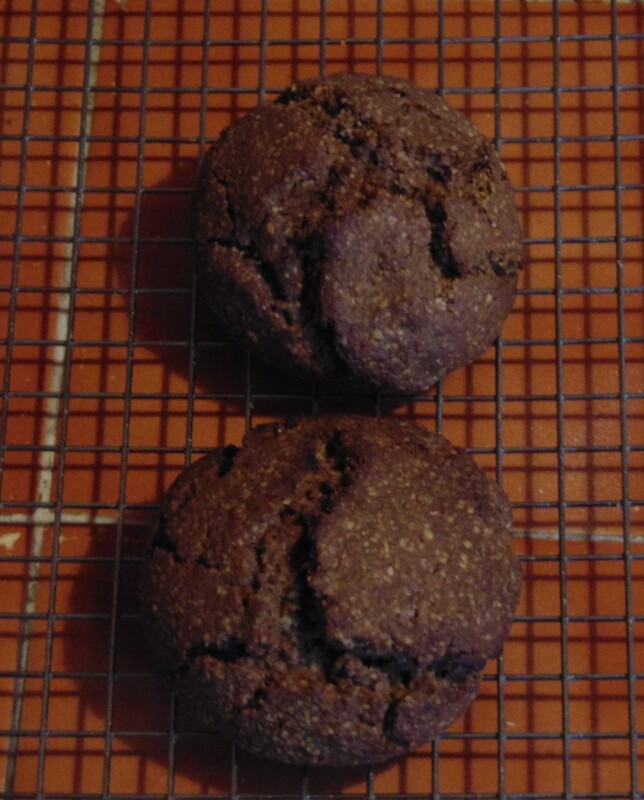 It didn’t work without the egg and flaxseed and with them it still has a slight stickiness, I used golden flaxseed, so brown might make it firmer and less sticky, I’ve found gold doesn’t absorb as well as brown, but tastes better. Teff seems to have it’s own inherent moisture, this is where it varies wildly from most other free-from flours, where ones like quinoa and amaranth can absorb a lot of liquid, not necessarily for the better at times, teff only needed 25 milliliters to be almost too wet. Why it has a better texture is beyond me, how a flour can be moist is a strange thing to think about, but it does. These are quick to make and created for that sole purpose, there are times when the freezer supplies have dwindled and I want something crusty and substantial. Where the buckwheat scones tend to be hard and brittle to the extreme these were at first brittle, I had to try one out of the oven to compare, when rested for an hour it was possibly to gentle cut it into two neat pieces, it didn’t fall apart as I ate either which is surprising. 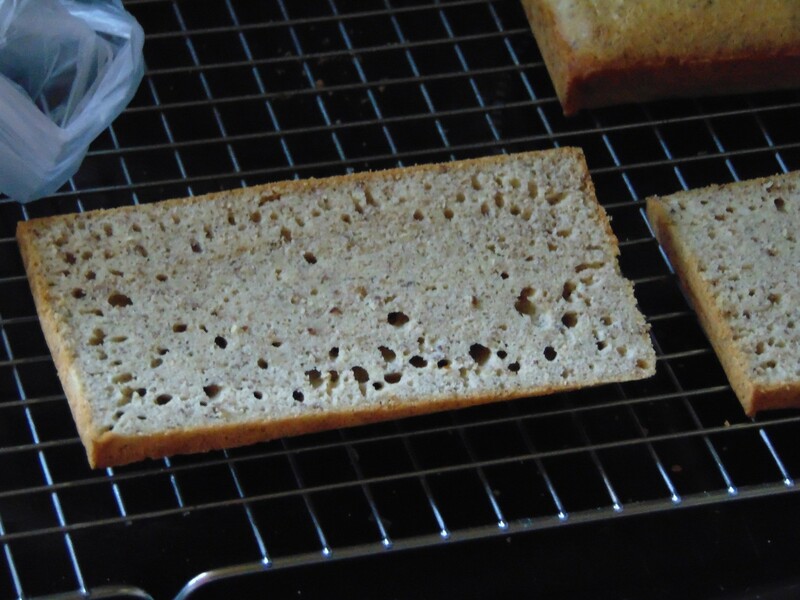 It has that springy texture that seems to be a given when using teff. It makes me curious about cutting it with other flours. Even when cutting cold a gentle cut is needed. Again, the taste is really something to enjoy. It has a slight nutty, bran like taste, still hard to describe. Strong, but not overpowering. 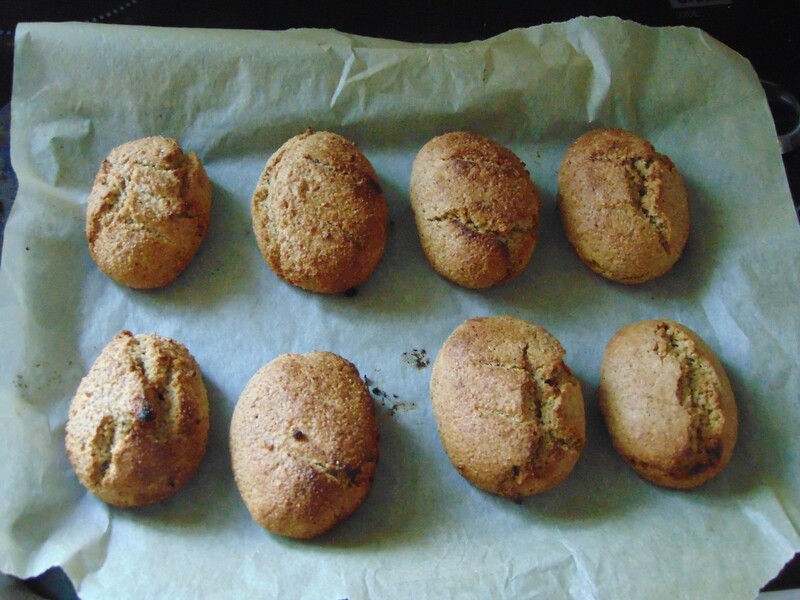 If I am going to make a teff scone to freeze it’ll be a take on my puree scone recipe, I have many, many scone recipes, Dear Reader, but still curiosity impels me. So, so far we know teff has a great taste, a pleasant moist texture, doesn’t have much stability for delicate uses like pastry and on the whole feels like a cross between quinoa and buckwheat, is a little like sorghum, but better in my opinion. 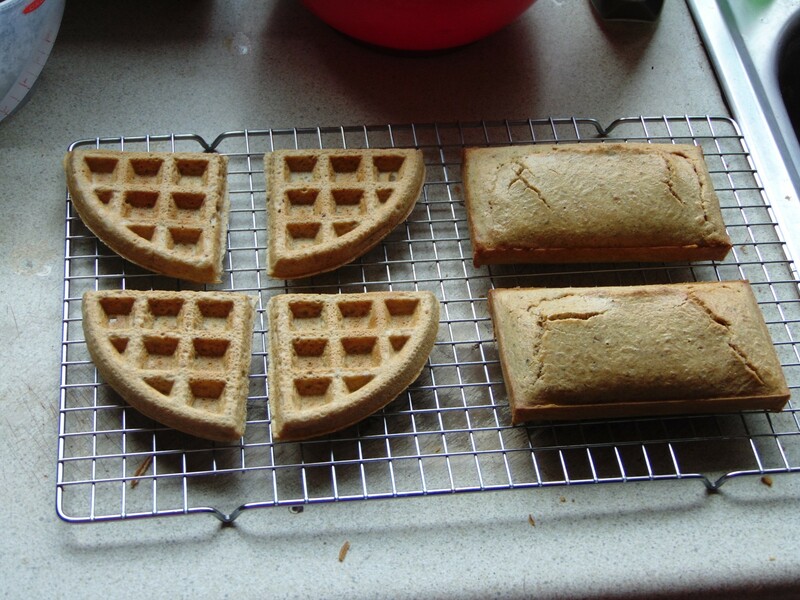 As for the future, well, microwave recipes are a given as they’re almost always successful, quick too. I’m curious about cutting it with rice flour to see if the texture can overcome the dryness of rice flour. Using it with buckwheat would be interesting. For now I use up this bag, then the remaining quinoa flour and check dates on my usual staples, I try to avoid wasting food, Dear Reader, even if it’d just end up in the compost. So, stay tuned for more teff recipes, I don’t foresee anything groundbreakingly new, but you never know. Until later, Dear Reader, take care. 1. Preheat oven to 200c (Fan) and line a baking tray with grease-proof paper. 2. Add all the dry ingredients to a bowl and then stir, with a fork in the Olive Oil and Egg until the dough starts to come together, adding a splash of water as needed. Dough should be soft, wobbly and slightly sticky. Form into a ball and rest for 5 minutes. 3. After the 5 minutes are up, the dough should be slightly firmer. 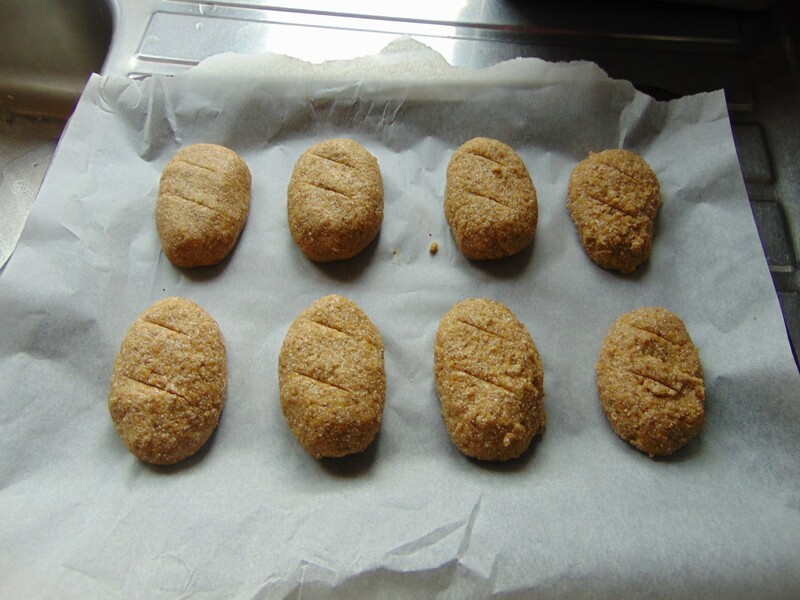 Split into two and roll each portion in a ball and press gently onto the prepared tray. 4. Bake for 20 minutes until scones are firm and a brown colour. Transfer to a wire-rack and let cool. I will one day learn to take better late-night photos. I’m a terrible food blogger at times, dear reader, I know that. I often run my own recipes down, because, well, they’re good enough to eat and consistent to make, but sometimes they’re just not that great and I couldn’t claim anything about them that isn’t the truth. That’s me, dear Jack, honest to a fault. Why put them at all I’m sure you wonder, quite simply as an emergency measure. I think of these as starvation recipes. I remember dark days when I had no idea what I’d be able to eat and stay in bodily health and happy in mind. I’ve faced so often the possibility that a staple of my diet may vanish into the ever uncaring void, unwanted by too many, even if desperately needed by a few. If I run out of a staple my whole diet takes a huge hit because its built on those staples, there’s no leeway, they’re all I can eat, I’m sure there are plenty of people thinking that of course they’ll be food, that’s a lovely luxury to have. I honestly hope they never come face to face with the idea of eating plain meat and rice, nothing else, for the rest of their lives. That was the position I found myself in and I pushed on, now, thankfully I’m much more equipped with the knowledge of what the ingredient I have can do, I’ve gone far beyond what many would have thought the limits. I’m ever near that edge, I’ll forever keep pulling away, so if ever you see me less than enthusiastic about a recipe, know that it’s born of a possible necessity, but it’s as good as recipe as I’ll share, maybe not the best taste or the most attractive, but it’ll work as well as any. Remember that food might be fuel, but excessive limits can be detrimental to he mental health of the one facing those limits. No one should have to be miserable. Life is complex, dear reader, thankfully Jack is an idiot and has no idea how complex it really is! They’re a bit messy if you work them to much. So, these are of course adapted from here, thanks me. I knew that all amaranth wouldn’t be a success and I also knew rice flour with gum isn’t going to work here, so I naturally didn’t use gum. I’m a genius. Instead I relied in the strength of the flaxseed and egg. The end result isn’t very stable, these scones aren’t exactly immune from crumbling, but they could be cut in half carefully. I often just butter the base and don’t bother cutting them. What’s the point? It’s just affectation, you’re just eating them and the less crumbs that fall the less of a slob you’ll look, I worry about your slovenly ways, I am of course impeccable. No you can’t see me, just trust me. Inside they’re nice and soft thanks to both the flaxseed and the amaranth. The extra sugar is to help cut though the taste of the unroasted amaranth flour, it’s still very pungent. These are pretty rough, but they come together fast and have a decent mix of flours that at least give you a varied nutrition boost. I use these as a bread replacement, stick some cheese in these, smear on some unsweetened peanut butter, not together, well, if you want go for it, a quick, filling “sandwich” with plenty to make it worth eating. You can make so many foods gluten free these days, but often they contain so little in actual nutritional value, I’d rather eat a slightly crumbly, pig-weed lump and know that I was giving my body what it needs to stay in tip-top shape. It ain’t pretty, but it works. Face it, dear reader, if I was just like every other blogger you’d have no reason to come here. See you again soon, dear reader. I have so many scone recipes. 1. Preheat oven to 200c (Fan) and line a baking tray with greaseproof paper. 2. Add all the dry ingredients to a bowl and then stir, with a fork in the Olive Oil Egg and until the dough starts to come together, adding a splash of water as needed. Dough should be airy and slightly sticky. Form into a ball and rest for 5 minutes. 3. After the 5 minutes are up, the dough should be firmer now and not too sticky, though it will be crumbly, split into three and roll each portion in a ball, wetting hands as needed, and press gently onto the prepared tray. 4. Bake for 17-20 minutes until scones are firm and a brown colour. Transfer to a wire-rack and let cool. Best eaten on day of baking. Let them cool completely before cutting. August 12th Update: I’ve added new photos below the recipe. I swear that if you start making a new recipe, carefully take photos of each stage, document each step with perfect clarity then it’ll fail and all that work will have been wasted. Whereas if you just fly by the seat of your pants, take no photos then you’ll succeed, ending up have only one photo and a pocket full of hastily scrawled post-it notes. I can’t even count, well I can but I’m making a point so shush, how may scone recipes I have made at this point, no, no, dear reader, you don’t need to count either. I like them as you n usually make just enough for one serving and that’s that. The trouble when using buckwheat like this is that the end result is often extremely crumbly, but as I say today luck, if not records, is on my side. Or perhaps I’m just experienced and know what I’m doing with these ingredients. The one thing about free-from baking is that once you understand the ingredients then it can be made to work like any other kind of baking. There are just more limits, more ways to circumvent those limits too. A lot of companies like to proliferate the idea hat you need to be something extraordinary to make any free-from product. That suits their profit margin, but it’s not true. Believe me or not, to be honest I no longer care. There recipes re here as proof, if after looking people still ca’t grasp the idea that someone trying to make money will lie to them or mislead them then, well, too bad. 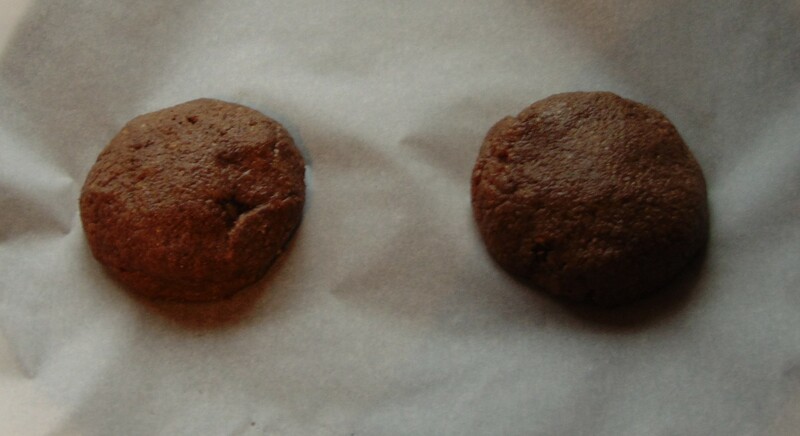 If you make them large an X slash on the top will help them bake quicker and more evenly. Now, my dear readers are too smart for that. So, let’s see what I did today that worked and why when possible. I opted for more flax to help soften, there was a fear it’d end up mushy so I didn’t use much extra liquid outside of the egg and oil. Flax absorbs hence the resting period. Buckwheat four because it’s a wonder four. Really there isn’t much here outside the usual. What was interesting is that when it all came together, with just a splash of water, it was this airy ball, just a bit sticky, really light and squishy. When rested it firmed up, but still had that trademark buckwheat crack when he dough was worked too much. A gentle roll in my hands and it was back to smooth. The work of a few minutes. 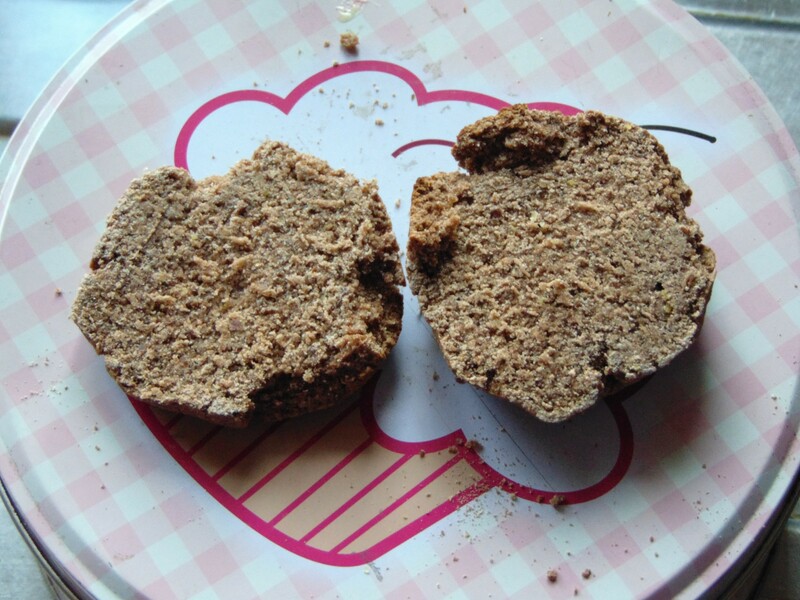 Now, I did let it cool before cutting and there was a bit of crumbing around the edges, but it stayed intact. When it was cut the whole was firm, really much more so than others I’ve made. Even when I bit into it it didn’t crumble at all, it was firm, but had just enough moisture and spring to stop it breaking up. 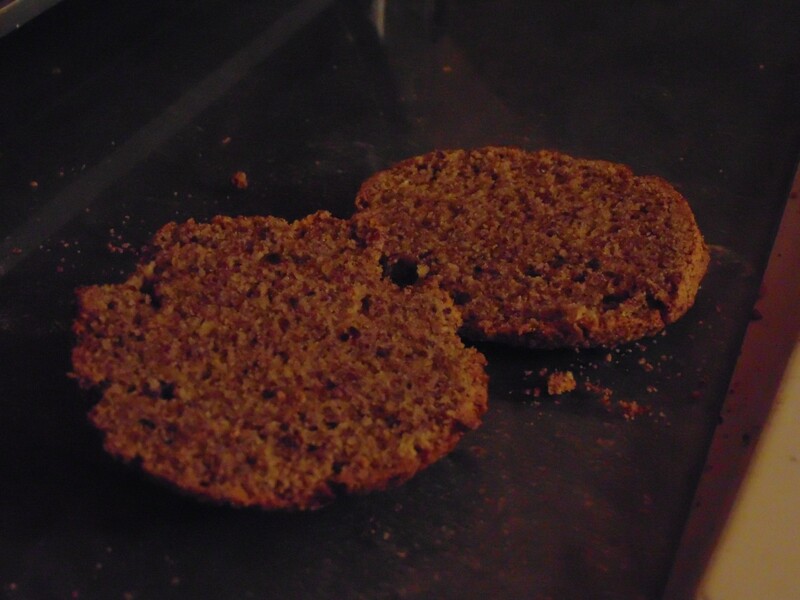 The texture is on the rough side, a pleasant grittiness if you will, and there is a strong taste of flaxseed. 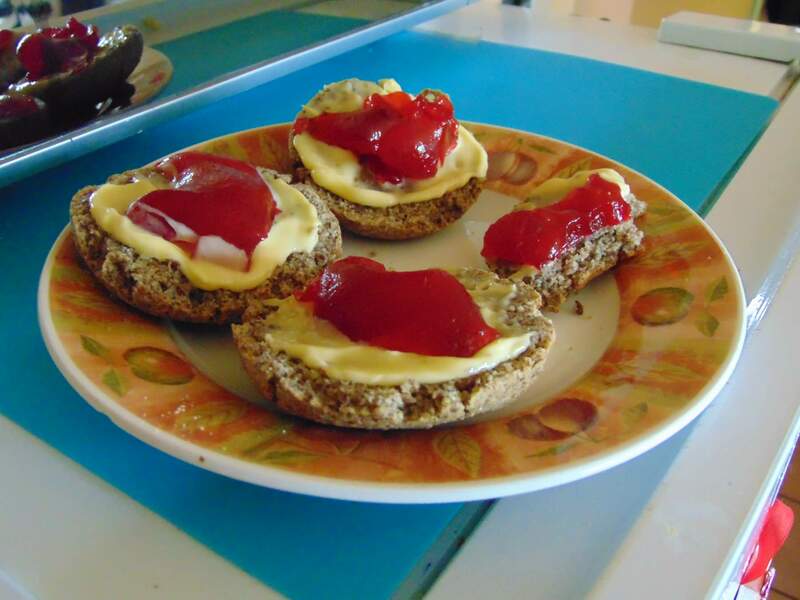 For such a simple recipe these were really nice topped with butter and jam, there was no cascade of cracked scone, taking my jam and butter with it on its journey to the floor or my tee-shirt, just a evenly textured bite, not too dry either. I think these are the best I’ve made so far. You do have to adjust your taste-buds when it comes to new foods, but that’s true of any diet or cuisine. I think too many people baulk at the idea of eating anything they’re unfamiliar with, never realising they’ve set their own level of “normal” and refuse to budge from it. I’m sure if a large portion of new coeliacs and free-fromers watched a child do what they do they’d be making snide remarks and telling anyone, poor devil, close enough to listen how they’d eat what they’re given. Well, I have scones and jam in me, so I’m good. See you later, dear reader. 2. Add all the dry ingredients to a bowl and then stir, with a fork in the Olive Oil Egg and Vanilla Extract until the dough starts to come together, adding a splash of water as needed. Dough should be airy and slightly sticky. Form into a ball and rest for 5 minutes. 3. After the 5 minutes are up, the dough should be firmer now and not sticky, split into two and roll each portion in a ball and press gently onto the prepared tray. 4. Bake for 20 minutes until scones are firm and a brown colour. Transfer to a wire-rack and let cool. Best eaten on day of baking. Golden flaxseed works much better. Before resting. Slash the tops to bake faster. Make little rolls or one long one if you’d like. Firstly a big thank you to Cooking Without Gluten for the original recipe. 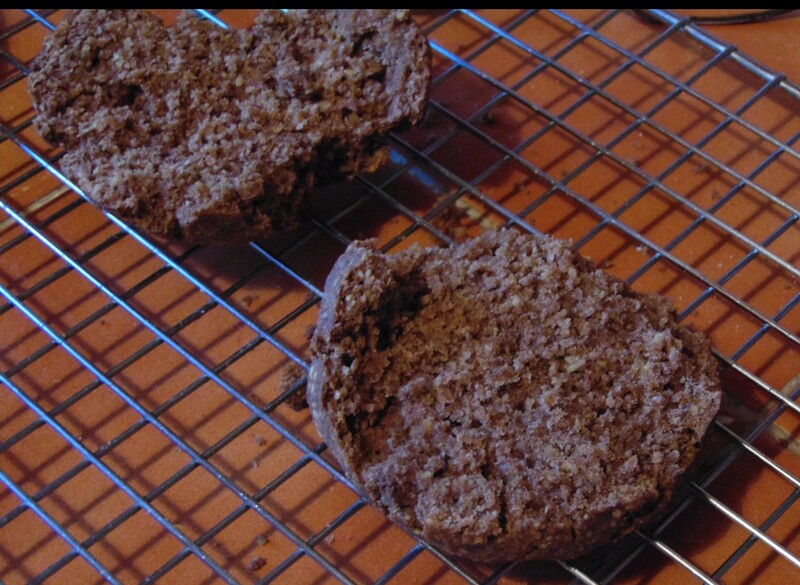 You might recognise this recipe as it’s similar to the Buckwheat Puree Bread which uses raw green apple. All I have changed is that I use a blender and a bowl, whereas the original uses a food processor for the whole lot. I’m just too lazy to make space in the dishwasher for the food processor. You think I’m kidding, right, dear reader? Heh. What’s amazing is how with just a few ingredients you can get a loaf that avoids so many problematic foods and ingredients. If you haven’t been to Cooking without Gluten then you’re missing out on a lot of recipes, information and inspiration. 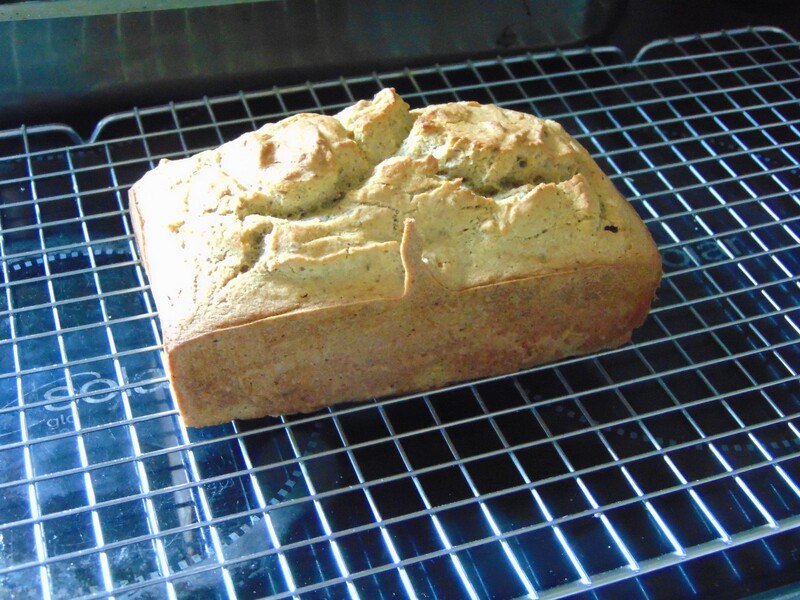 I don’t have many oil free breads on the blog. This is such a fast bread. One mistake I made was that I should have added more water, the cauliflower I was using was freshly picked today and was slightly drier than it should have been. I need to add water to facilitate blending, but extra would’ve prevented the pockets in the bread, they were slight so it didn’t really affect the bread at all. That’s actually what makes this such an interesting bread, you’re using raw cauliflower to replace the oil and to impart a mild taste. I wasn’t wild about the taste as I’m not a huge cauliflower fan. I eat it and enjoy the benefits, but I’ll often mix it with other vegetables. In saying that, whatever topping you use will disguise the taste if you’d rather. It doesn’t taste raw, just has a baked cauliflower taste. The texture is where this bread shines, it has a firm, springy texture. 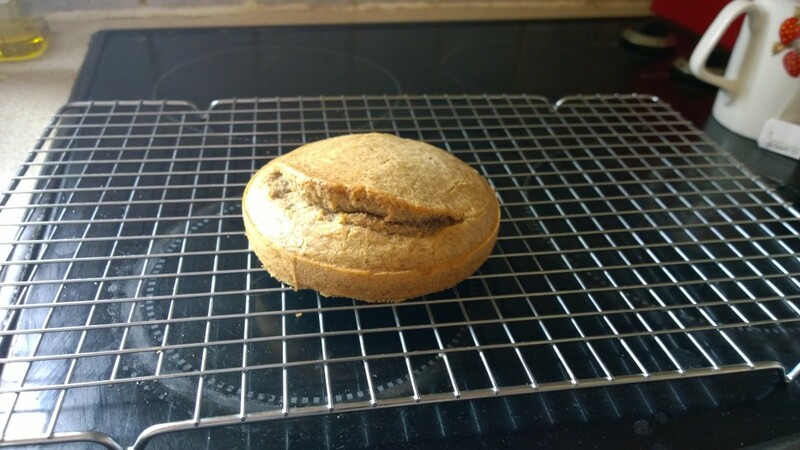 A really solid bite to the bread, not the soft mushy bread you sometimes get when eating gluten free loaves. It has the same elastic feel as the apple version. A quick cool and it’s ready to slice. It does take a long time to bake so you might be best to bake a few loaves at once to save yourself time. It bakes at the same time and temperature as the apple so you could easily bake both. I love using fresh produce to make new recipes like this. I had seen it previously, but it slipped away and until I saw a small cauliflower had popped up I hadn’t thought of it. I had just a little over the required weight to boot. 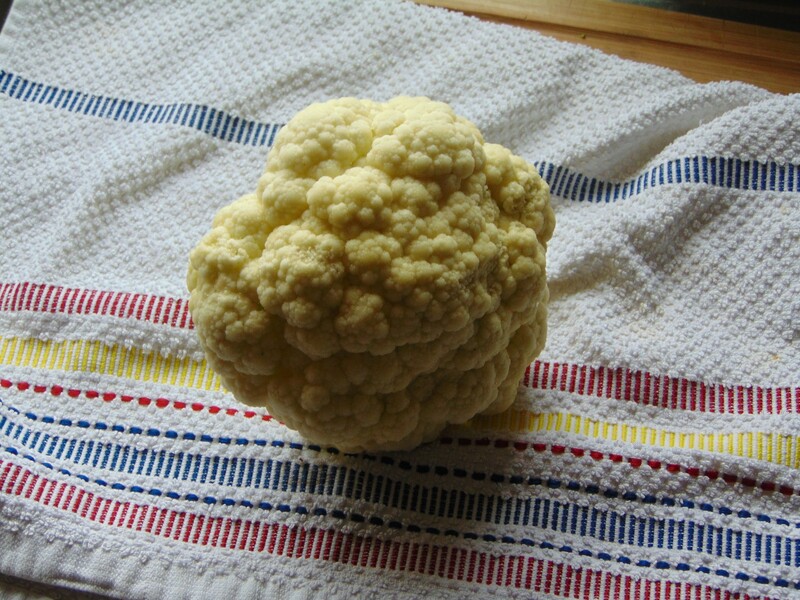 I’ve now tied my record of cauliflowers harvested last year, all going well I should be able to break that record. I think this bread exemplifies what I want to do in my free from journey, I want food that utilises every strength, regardless of how nontraditional. I’ve often said that Cooking Without Limits and my own blog are very similar in their methods and approach to recipes, I hope I can match up to the creativity contained in every one of the recipes there one day, I’ll keep working at it for now. Now I wait for more to grow and we see what can be done. I will be busy prepping for the surgery again, all going well at the end of the month, but I’ll wait and see. So I don’t know when posts will be written. They might be written daily, scheduled and there’ll be way too much of me or they may get a bit slack. Depends on the weather really, if the garden blooms you’ll have Jack at least, if it’s productive you’ll have Jack in a chef’s hat. Until later, take care, dear reader. 1. Preheat oven to 170c (No Fan). 2. Grease, with Butter, and line a 6×3 inch loaf pan. 3. 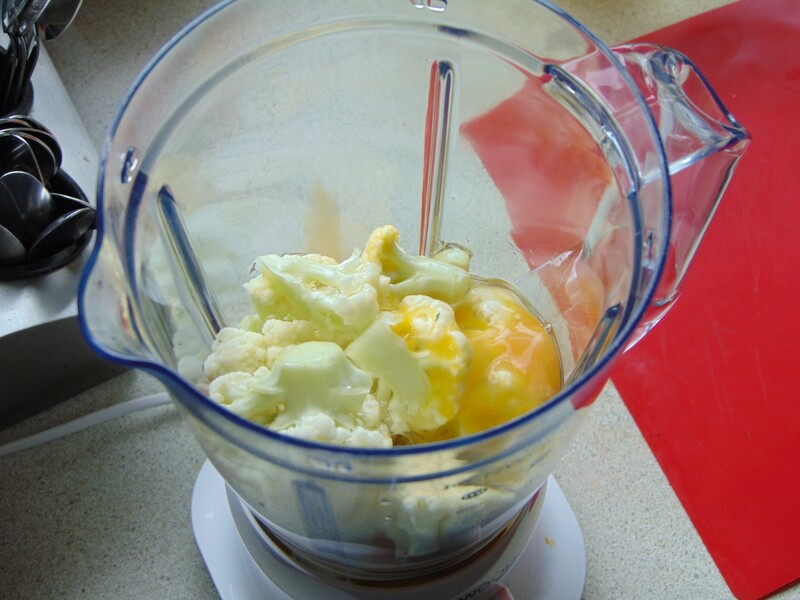 Blitz the Cauliflower and Egg together, add a little Water if needed, until smooth and set aside. 4. Add everything else to a bowl and shake together. Then add in the Egg mixture. Stir together with a fork until combined. Batter will be elastic and thick. 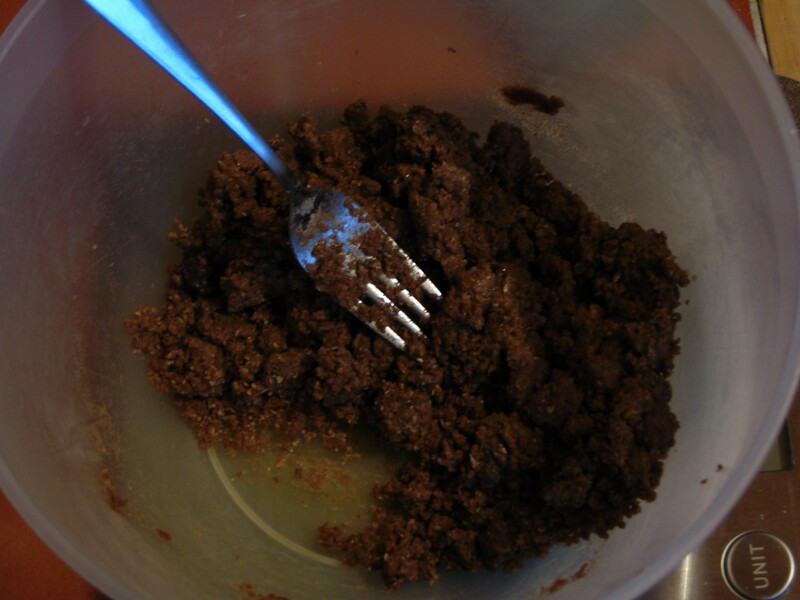 Add a little Water until the batter is more of a runny consistency. 4. Pour batter into prepared tin and bake for 60 minutes, turning halfway if needed, until golden brown and a skewer comes out clean. 5. Cool in tin for 10 minutes, then remove and let cool completely on a wire rack. Now we wait for more cauliflower. 2017 Update: Due to a problem with Photobucket, see here, there will be a lot of recipes without photos. I will be slowly redoing the recipe pages, as best I can, but many other posts will be impossible to replace. I’m doing this in my own time, while continuing to update the blog with new recipes and posts. If you’d like to donate, any amount appreciated, you can do so here. The site will always be free, the recipes will never be locked behind a paywall, but this is a lot of additional work. I’m not demanding or begging, just putting it there so if you feel like repaying my hard work you have that option. I don’t make any money from the site, all that I do here is to help others, I couldn’t charge for that. Bippity-bap. It’s, yet again, Jack! May 17th Update: They cancelled my surgery. Now I have to wait, again. I have no idea when it’ll happen now. I don’t know when the blog will resume, bear with me, dear reader. Typed on the 16th May. Heh…hehhh…er. Dear reader? Spanky? I may be just two days away from pretty major surgery. That’s still hitting me, I’m trying not to let it consume me, but I’m scared. I know I wanted this, still do, but it’s getting real, if you get my meaning. That’s one of the reasons I’m typing up so many of these posts, as a distraction, as a means to keep the blog going after I get back and have to start recovery mode. I feel like my clock stopped over three years ago, when I first started this leg of the journey, and suddenly it’s started and is whirling out of control. I’ve prepared all that I can. For the hospital stay and after. There’s so much I could talk about, I’m just me, losing ten stone, dealing with the affect effects and all this is too huge for me to talk about now, maybe after, maybe never. This kind of things happen to other people, not to quiet, unassuming people like me. To the recipe. Why a bap? 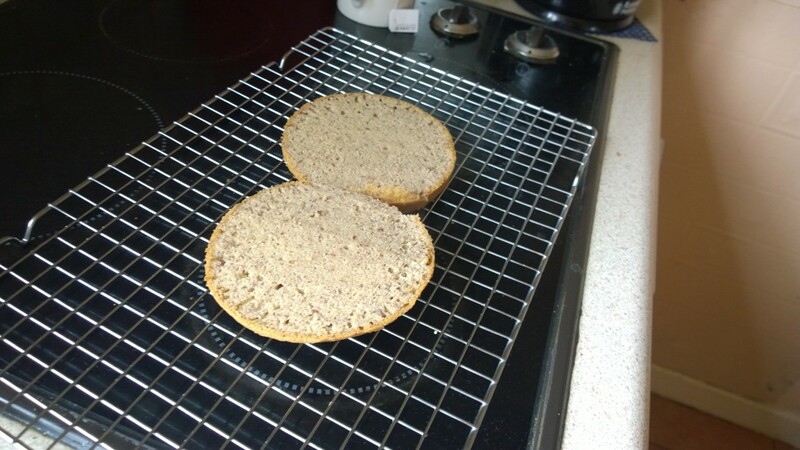 Because I wanted a sandwich This is a tweak on my Buckwheat and Quinoa bap. 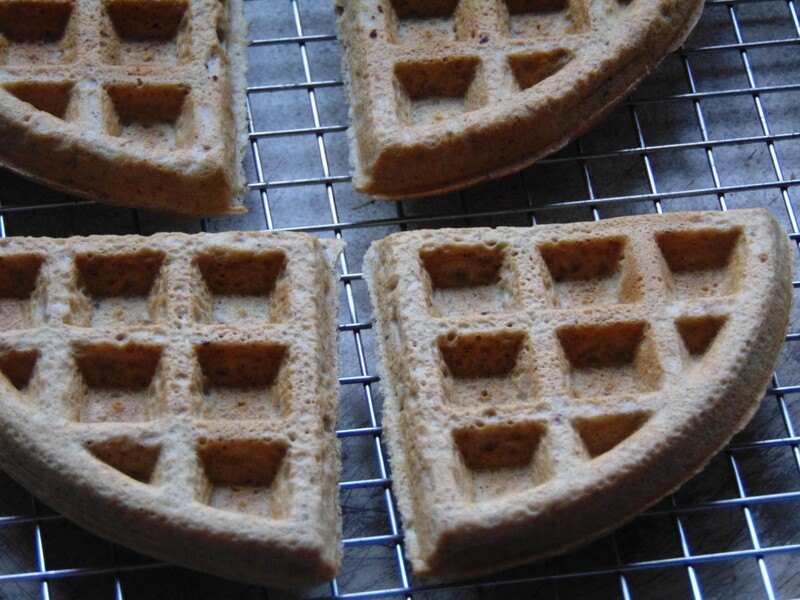 Go there to get a fair idea of the texture and intricacies of the recipe. I’m in quick-mode today. As I’ve mentioned there is little strength in sorghum and it’s very evident here. 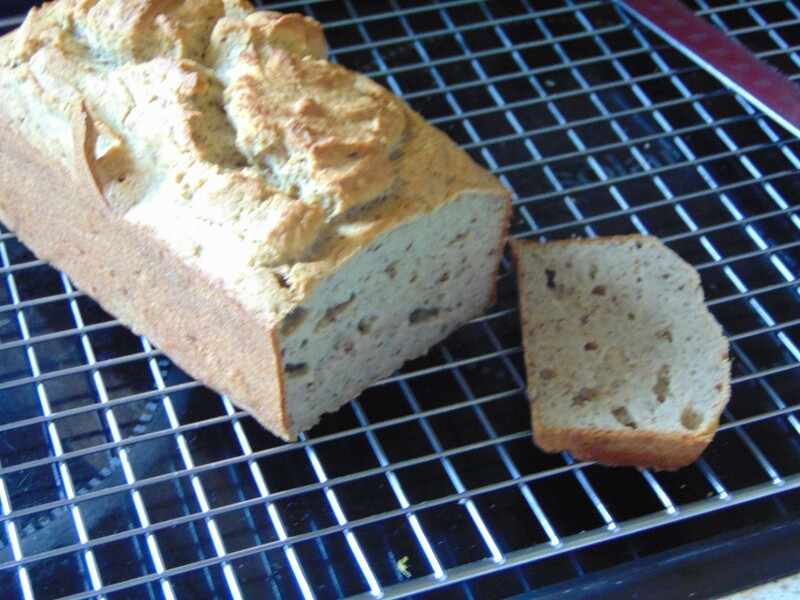 Even with buckwheat and flax the bread starts crumbly while warm and as it cools stays somewhat brittle. Don’t get me wrong, it won’t crumble to dust in your hands, but it can’t be manhandled without cracking. What of the benefits of sorghum? One is the taste, there’s a pleasant, almost sweet taste, I really enjoy. There’s also a lightness that I think could be useful in lightening other recipes, but I’d advise only using a little of the sorghum. I will be buying another bag, or two if possible, in the future. There might not be a lot of new recipes or a while, but there may, I won’t say anything for certain, it all depends on how I feel. And let me tell you something, dear reader, Jack is tough, not arrogant, braggadocios, grandstandingly tough, but tough enough to know what he can do. Life has handed me plenty of challenges and I’ve overcome a lot. So have no fear, Jack will be back better than ever. Take care and spare a thought for Jack. Sorghum will be conquered in time. 1. Pre-heat the oven to 175c (Fan). Grease, with Butter, and line a 4 1/2 Inch Springform Tin. 2. 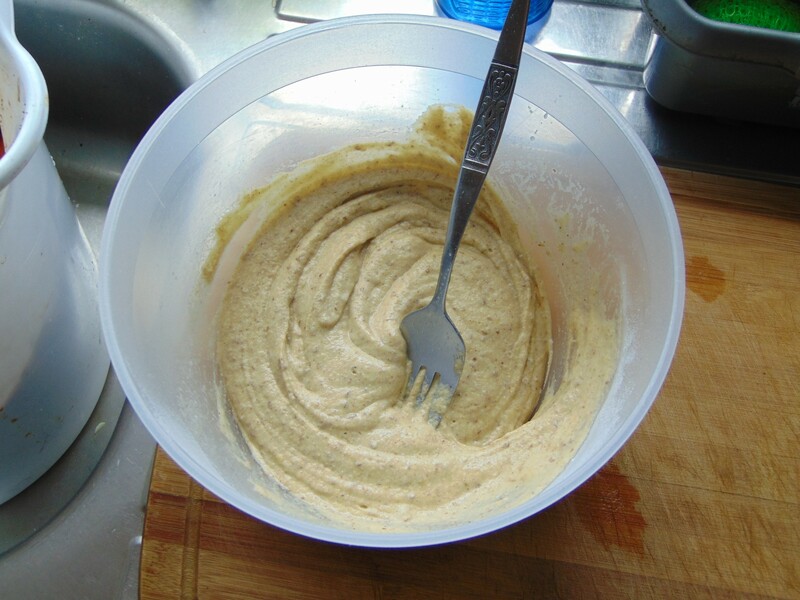 Mix together the Olive Oil, Eggs and Water and then add the Flours, Flaxseed and Baking Powder and mix until until a runny batter has been formed. Let rest for 5 minutes. The Batter should be thick but stirrable. 4. Pour Batter into tin and bake for 25-30 minutes, turning half way if needed, until golden brown and a skewer comes out clean. Then remove from oven and cool for a few minutes then remove from tin and transfer to a wire-rack to cool completely.